When you start up Linux on your box, generally you are taken to a graphical login screen (unless, of course, you have configured things differently). This graphical login screen is called the display manager. To take a look at the differences, and see which one you like, install them with your package manager. With OpenSUSE, this is yast or zypper. # Here you can set the default Display manager (kdm/xdm/gdm/wdm/console). You’ll notice that the first couple of lines tell you what to put in for the display manager you want to use (kdm,kdm3,kdm4,xdm,gdm,wdm,console). Put in different ones and see what floats your boat. When you get it how you like it, stop. I didn’t see xdm available on 11.1, but I could be up in the night. You’ll notice that it tells you what to put in for the display manager you want to use (kdm,kdm3,kdm4,xdm,gdm,wdm,console). Take a look at them, see which one suits your fancy, and use the one that makes your heart tingle. 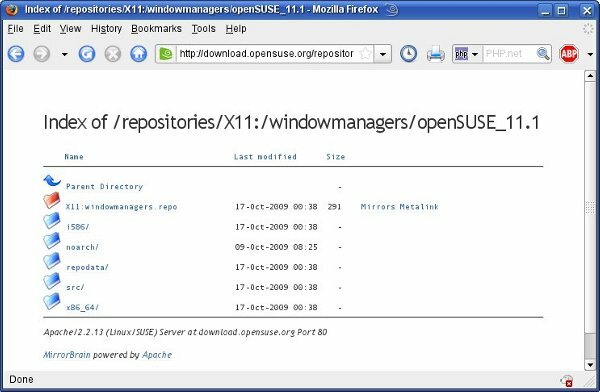 OpenSUSE Linux provides a command-line method of managing repositories and packages. This tool is called zypper. The following is a basic tutorial by example of how to use zypper. Leave out the “-r” and leave off the name of the repo if you want to refresh all of them. Repository 'Packman' has been removed. ID3 tags are found in MP3 files. They canstore information about what band recorded the song, the song name, and more. ID3V1 tags are seriously deficient as to the kind of and length ofinformation that they can store. This is a tool for editing ID3V2tags in Linux. Overall download size: 30.0 K. After the operation, additional 79.0 K will be used. After the operation, 79.0 K will be freed. These are some common zypper commands that will help you manage your repositories and packages from the command-line. In the search for a full weight loss program for my window manager (I’m switching from KDE 3.5 to XFCE4), it became clear that another terminal would have to replace Konsole. After 11 full minutes of considerable thought, agonizing contemplation, deliberation and extensive research, aterm became the obvious choice. aterm looked interesting to me because it has a small memory footprint. Konqueror takes up about 7 times the RAM that aterm does, while xterm takes over twice the RAM that aterm does. aterm also has very little dependencies. Additionally, it supports pseudo-transparencies, while remaining very responsive and quick. Overall download size: 310.0 K. After the operation, additional 1.1 M will be used. Now, run aterm in a terminal window or something to make sure it’s installed. On to the configuration (which is the cool part, really). First, determine which font you want to use by running xfontsel. It opens up a window where you can fine-tune the font you want aterm to use. Then, you’ll want to set up your configuration file. I use .Xresources although there are others you can use.
! Do you want a scrollbar?
! How many lines do you want to save in the buffer?
! Do you want transparency?
! Do you want transparency in the scrollbar?
! How much transparency do you want (in percent)?
! How many characters wide and tall should your window be?
! Do you want a visual bell rather than an audio bell? Hopefully, it’s apparent that you can use exclamation points for comments. Everything in this sample .Xresources config file should be fairly self-explanatory. If you are running that command in an open aterm window, you will have to close the window and re-run aterm. aterm is very quick and responsive, looks nice, and doesn’t take up too much memory. Take a look at it, play around with it, and enjoy it. In OpenSUSE Linux, we have a wonderful thing called One-Click Install. This is a marvelous thing for new users. I love it to death, and care for it as I would my own child. Almost everyone knows that this is very cool except for maybe Christer, as he is not a believer (nuttin but love bro, loved your presentation @ UTOSC). That said, what happens when it stops working or gets broken? Let’s head over to the OpenSUSE Build Service. 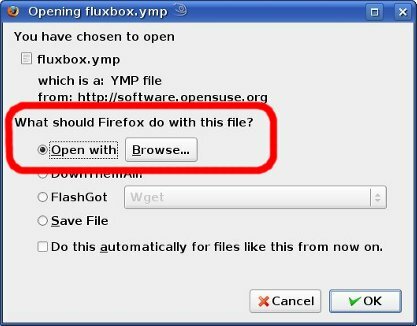 Search for something cool like the fluxbox window manager. The results come up, and you click on the 1-Click Install. However, if it is broken, you will not see the “YaST Meta Package Handler (default)” in the OPEN WITH radio button drop-down. The first thing to do is tear your hair out. If you don’t have any, turn to the closest person to you (I do not recommend a spouse unless you want to spend the rest of your life on the couch). Overall download size: 920.0 K. After the operation, additional 3.6 M will be used. Houston, we have landed. Now, go enjoy your new package. This method should work with virtually any package where the 1-Click install fails. ¡Por fin! It’s about time they did something like this with OpenSUSE Linux. Uses for this are infinite. What a fantastically cool concept. Now honestly, who couldn’t use that? The versatility of Linux never ceases to blow my mind. I mean, to each their own, but if you are looking for the X-11 of consumer-level operating systems, Linux stands up to the test, tell you what (tell your mom, too). At some point or another, you’ll likely end up needing an SSL certificate for a Web site somewhere along the line. For a commercial site, your hosting provider can or will help you get this all squared away. This article is not for people in that situation. What we’re doing here will be to create our own Certificate Authority. Then, we’ll create our own server key and a signing request. Then, we’ll sign our own certificate using the key and certificate from our own Certificate Authority. In other words, we’re not just going to create an SSL certificate, but we’re going to sign that bad boy, too. This is useful for personal websites that need a little security, or when you’re waiting for your real cert from a real Certificate Authority. Perhaps you need it for transmitting data from an external server to your Intranet. Or perhaps you need it in any of the three hundred thousand seven hundred forty-two other situations that may arise. The first thing that you’ll need is root access to the server. SSH in and head somewhere secure like /root. Next, we’ll go ahead and generate our own Certificate Authority key. In this step, we are impersonating someone like Verisign or Thawte. Well, not impersonating, but we are going to do the same thing for ourselves that they would normally do. Note that those pass phrases are something you make up right then. You are not authenticating anything, but rather setting up a pass phrase for authenticating later. Again, those pass phrases are something you make up right then. You are not authenticating anything, but rather setting up a pass phrase for authenticating later. Now… let’s see… oh yeah. Now, we have to create a signing request, or CSR, from the server key we just made. This signing request will usually make a trip to a genuine Certificate Authority to have the key signed and a real, verified, bonafide signed certificate returned back to us. So, to generate our signed certificate, we’ll need to first have a signing request so we can make the signed cert. See how that works? Now, we are going to take all these files and make them do some voodoo. We are going to sign the signing request using the Certificate Authority certificate and key that we made at the beginning. What we will get is our perfectly forged signed certificate. OK, not perfectly, because we are not a real CA. But we’ll get a pretty darn good signed cert that will work for us rather nicely. drwxr-xr-x  2 root root 4096 2008-06-02 13:54 .
drwx------ 10 root root 4096 2008-06-02 13:35 ..
Now, here’s where things depend on the distribution that you are using. I will describe what I am doing so that if you are not on OpenSUSE, you will still be able to get this working. Yep, pretty complex stuff, moving files. Now, we need to make a handful more edits to some files, and we’re just about there. First thing is to edit /etc/sysconfig/apache2. Search through that file for the directive called APACHE_MODULES. Make sure you see ‘ssl’ in there. If not, add it. Then, search through the file and find APACHE_SERVER_FLAGS. Make sure it has ‘SSL’ in it. If not, add it. Save and close the file. You can also manage apache’s modules with the ‘a2enmod’ command. To view the list of loaded modules, run ‘a2enmod -l’. In OpenSUSE, it’s really easy to have virtual hosts on a machine. I have like 10 on mine. One of them is my blog, www.suseblog.com. Well, to make this easy, in OpenSUSE, the virtual domain configuration files are located in /etc/apache2/vhosts.d, each with their own name. My www.suseblog.com configuration file is called suseblog.conf. To set up SSL for this virtual host, just duplicate the file and give it another name. In my case, I named it ssl-suseblog.conf. Now, we’re going to open up that file and add like 4 lines to it. No sweat. Save and quit on that one, too. We can configure this thing perfectly, but if the firewall doesn’t know to let traffic through, we will not have HTTPS access to the server. Let’s check the firewall really quick to make sure. Fire up YAST. Go to the Security & Users option on the right, and select FIREWALL from the left. If you do not have a firewall running on the machine, you can just exit now. If you do, you will need to go to ALLOWED SERVICES. In the SERVICES TO ALLOW drop-down on the right, select HTTPS Server. Then click ADD. Then click NEXT, and finally FINISH. You should now have port 443 opened for HTTPS business. OK, so we’ve been chatting a bit about the upcoming release of OpenSUSE 11.1. If we throw an eyeball at the official OpenSUSE.org server, the newest thing available from the official OpenSUSE.org server is not a GM. When it is a GM, DO NOT DOWNLOAD IT FROM THAT SERVER. That only hogs bandwidth that they use to transfer it to the mirrors. Wait about 4 hours, and then pick your favorite mirror and pull it down from there. But unless I get a personal email from Stephan Kulow or Andreas Jaeger or Michael Loeffler, stating otherwise, I’m reasonably sure that the OpenSUSE 11.1 GM is not publicly available, yet. However, now you know how to check for yourself for sure when it has been released. But if I catch you downloading from there the minute they put it on there, so help me…. So we know the GM exists, but it’s the “Where’s Waldo?” element of it that still has my OCD in overdrive. How many ways can you install an RPM in OpenSUSE Linux? Package management in OpenSUSE in recent years has had its share of challenges. In OpenSUSE 10.1, the package management was an epic trainwreck. Package management in OpenSUSE 10.3 is as good as that was bad. There are various types of speed improvements. Some of them huge. There is some caching of the repository package info. Progress bars so the user knows what’s going on. All sorts of goodness. But I wanted to see how many ways I could install a package on OpenSUSE 10.3 (and 11.0, for that matter) without any help from any third-party package management tools that don’t come stock on a fresh OpenSUSE install. Like no apt, yum, smart, etc. Just using the package management tools that come on the fresh install, how many ways can one install a package? There’s a method to this madness, too. You never know under what circumstances you’ll have what access to the machine you’re working on, especially if it is remote. One of the mantras of Linux pros is that there is four billion ways to skin a cat. OK, so I made that up. It’s good to know many ways of doing the same thing, though. Especially if we want to automate something. If we do it one way, maybe it requires human interaction. If we do it a different way, no human interaction is required, and thus, we can automate that process. OK, without any more excessive yammer, let’s take a look, shall we? 1. Use YAST – Let’s get the obvious one out of the way. Click on the YAST icon, put in your root password. In the window that appears, select SOFTWARE from the left, and SOFTWARE MANAGEMENT on the right. At some point, the YAST Package Management window appears. Search for the desired package, click ACCEPT. Approve any additional necessary packages. YAST installs everything, and asks if you want to install or remove more packages. Say no, and you’re done. 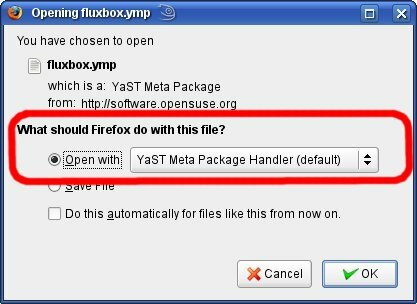 This is the classic way to install packages in OpenSUSE using YAST. One benefit is that it does a good job of resolving dependencies for you. One possible drawback is that it reauires all kinds of human interaction. So there’s our first way. --version, -V           Output the version number. --quiet, -q             Suppress normal output, print only error messages. --terse, -t             Terse output for machine consumption. --table-style, -s       Table style (integer). --rug-compatible, -r    Turn on rug compatibility. --non-interactive, -n   Don't ask anything, use default answers automatically. --no-gpg-checks         Ignore GPG check failures and continue. --root, -R <dir>        Operate on a different root directory. repos, lr               List all defined repositories. update, up              Update installed resolvables with newer versions. Overall download size: 10.8 M. After the operation, additional 15.0 M will be used. It resolves all dependencies, and installs everything it needs. Great way to do things without so much human interaction. There are even flags that will allow us to omit human interaction entirely (–non-interactive and –no-gpg-checks). Very nice. This is one of the possibly more difficult ways to install an RPM. Not because it’s a difficult command, but because it doesn’t resolve dependencies. If there are dependencies, you get to resolve those babies yourself. It’s possible, but I would definitely prefer a poke in the eye with a sharp stick. 4. 1-Click Install – Tell you what, one of the coolest things that OpenSUSE has come up with thus far is the 1-Click Install. At first, I thought it was an April Fool’s Joke. But realizing it wasn’t April, I decided to give it a try. To see how cool this is, head over to the OpenSUSE Build Service. Search for a package like kopete. Scroll through the results. When you find the one you want to install, click on the “1-Click Install” button off to the right side. You’ll have to verify some things and provide your root password, but other than that, it is virtually hands-off installation of the package. Hands-down easiest way to install packages in OpenSUSE. 5. Install with YAST from custom installation repository – Sometimes, you will have an rpm that you want installed, but cannot find it in YAST. You can download it and try to install it with rpm. The problem is that it has 12 dependencies. What then? Switch distributions to something more sensible? No way, we’ll just take the easy way out. Create our own repository and point YAST to that. This process is very simple. Then, just add that directory as an installation source in YAST=>SOFTWARE=>SOFTWARE REPOSITORIES. Finally, go into YAST=>SOFTWARE=>SOFTWARE MANAGEMENT and search for the RPM you placed into your new repository. You should be able to find and install it easily. The great part here is that YAST should be able to resolve the package dependencies. Yes, there are a few steps involved here. However, you can take this concept and apply it to an entire network of desktop or server machines. Pick a repository server on your network and create your own repository on it. Then, export that repo via NFS to the rest of the network. Next, just add that repository to the other machines on the network. The great part is that you only have to add the repository to each of the other machines once. But then, instant access to install that package on any of those boxes. This particular solution has been very helpful for me on several occasions. 6. Install with zypper from custom installation repository – Same thing as the previous method. We download a stand-alone RPM that has many dependencies. So the approach will be similar. Install createrepo, make a repository directory, and put your RPM in there. Use createrepo to build your repository as demonstrated above. [root@linux:/home/scott]$ zypper addrepo /my_inst_src "My Installation Source"
If the package is so brand-new that it has dependencies that are unresolvable, obviously you’ll have problems. But for many common packages, this method works great. As a side note, you can also set your machines up so that you don’t even need the discs to install packages. Put the DVD ISO on your machine and you can put that into YAST as an installation source. Disable the source that uses the local optical drive. Then, it will pull packages from the ISO. Even better, you can put that DVD ISO on a server on your network. Mount it on that server, and export the mount point via NFS to the rest of the network. Go to each machine in the network. Disable the source that uses the local optical drive. Add the NFS share from the server as an installation source on each box. Then, the machines on the network will pull packages from the NFS share. NOTE: Don’t use this, it has been updated. Go here for latest. I was fooling around with an alias that would help someone know at a glance what machine they are on, who they are logged in as, their current path, the date, uptime, and some memory stats. This is something that I have found helpful when I have several remote servers open and logged into each one with several different accounts. It’s easy to know at a glance where I am doing what. printf "  Total RAM:\t$ITEM Mb\n"
printf "  Used RAM:\t$ITEM Mb\n"
printf "  Free RAM:\t$ITEM Mb\n"
printf "  Total SWAP:\t$ITEM Mb\n"
printf "  Used SWAP:\t$ITEM Mb\n"
printf "  Free SWAP:\t$ITEM Mb\n"
This is great for when you come back to work from a long weekend, have 300 terminal windows open, logged into 32 servers with 43 different accounts. If you wanted, you could also put this into the /etc/skel/.bashrc file so that all new users on your machine will automatically have this alias. Change to suit your taste. If you do this, and an FBI satellite crashes into your new Porsche, it’s not my fault. I am under no delusions of grandeur here. If you know of a better way to output the info, or more info that you’d like to output, or you modify/change it to make it better, please let us know. Suggestions, tips, tricks, comments, and even mild insults are welcome.